His slogan is “En Marche!” which means “On the move!”, and judging by Emmanuel Macron’s impressive run in the polls, it’s quite apt. Although he is still just behind Marine Le Pen in most opinion polls about voting intentions for the first round on April 23rd, he’s far ahead in the projected second round run-off for May 7. With the conservative candidate, Francois Fillon, embroiled in scandal, Macron is now favourite to be France’s next President come May. Until now his surge has been largely based on his personal charisma and appeal as neither a traditional candidate of the left or the right. But as the reality of President Macron edges closer, his policies, particularly those for the economy, are coming under closer scrutiny. So what exactly does this former investment banker and protégé of President Francois Hollande stand for? If he wins Macron will assume office at a time when the need for economic reform is clear, as the FT point out. Since the financial crisis, France has grown much more slowly than its major competitors (see Chart). Despite some modest reforms to the labour market and cuts to corporate taxes under President Hollande, unemployment has remained elevated – it is over 9% compared with less than 5% in the UK and Germany. Public spending, at 57% of GDP, is bloated, while the budget deficit remains above the Maastricht ceiling of 3% of GDP. On the Wake Up 2050 Index, France is ranked just twentieth out of thirty-five OECD countries – below the UK and Germany. While French workers are productive and the country has some world-leading companies, for many years its economy has been trussed up with rigid labour markets and excessive business regulations and public spending, particularly on the elderly. Only 2% of the over 65s are still in work, while the country devotes an eye-watering 14% of GDP to pensions (third highest in the OECD). In effect the country is paying people not to work – hardly a recipe for future prosperity. Macron’s plans for the economy appear to be a careful blend of traditional policies of the left and right. Since the biggest political question he will face if elected president is that of whether, lacking his own national party, he will be able to muster a working majority in the French Parliament (the elections for which follow the presidential vote), this implies a desire to avoid offending too many people. On the one hand, he promises to cut public spending by €60bn, eliminate 120,000 public sector jobs over five years, and keep borrowing below the 3% ceiling. He also wants to give employers more freedom to set working hours and pay. He is proposing to cut corporation tax to 25% and reform the wealth tax to exclude financial assets (effectively making it a property tax). On the other hand, in a sign of his commitment to the welfare state, he wants to extend the right to unemployment benefits to the self-employed, entrepreneurs, farmers and those who leave jobs voluntarily. This would make unemployment benefit more closely resemble the Universal Basic Income advocated by many. He is promising a €50bn public investment programme, to be spent on training workers and green technology. But probably the most damning analysis so far comes from the Circle Necker, a group of experts on economic policy. 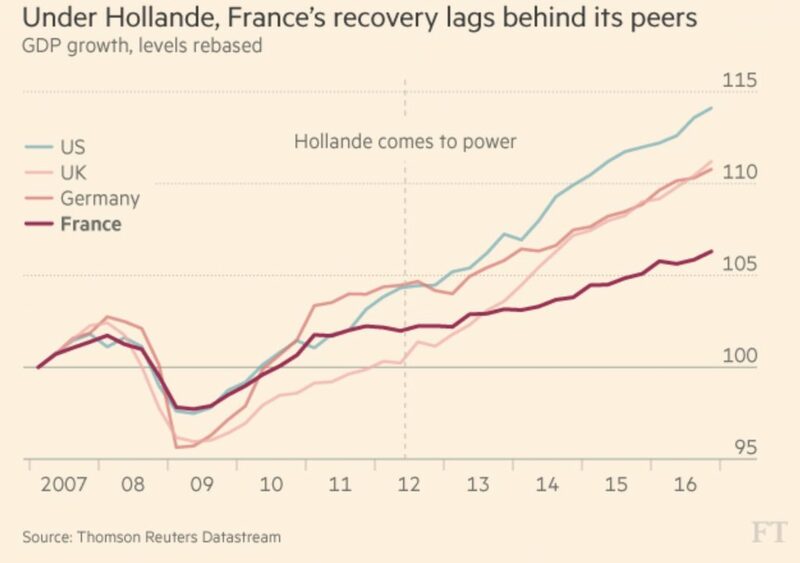 They, too, see Macron-onomics as essentially a modest continuation of the Hollande programme, if packaged a bit more attractively. If Macron implements his reforms, then by 2022 public spending will have fallen from 55% to 52% of GDP. But that would still be way above the level of 43% in the UK and Germany. They also point out that the proposed cuts in the civil service, if they are successfully implemented, amount to less than 1% in productivity gains. Another telling criticism is that some of Macron’s public expenditure savings assume that unemployment will fall to 7% – a level not seen since 2008. If unemployment remains closer to 9% then those savings will simply never materialise. But perhaps more notable than his reforms are where he is not proposing change. Although he made critical sounds in the past about the 35-hour week, now he has declared no intention to reform it. Even more significantly, he is promising to keep the current retirement age and existing pension entitlements. So the enormous burden on the public finances will only worsen. It’s hard to escape the conclusion that Macron’s programme is at best too modest, and at worst, just ignores France’s fundamental problems. The rise of Macron is proof that France is tired of its political parties and the sometimes corrupt and ineffective politicians who lead them. But his timid programme suggests he does not believe the country is yet ready to overhaul its creaking economic system. After all, things aren’t good, but they’re not catastrophic, either. As Finance Minister under Hollande, Macron was the author of a modest reform to the power of employers to negotiate overtime or dismiss staff. Nonetheless it faced massive opposition, resulting in strikes and protests. The scars of that experience clearly linger, and explain his caution. For a country that is nearly, but not quite, ready for fundamental reform, that could be why Macron is the man of the moment.